Despite recommendations for dental check-ups every six months, we often see people in our Katy dental office who have not been to the dentist many years – sometimes decades! 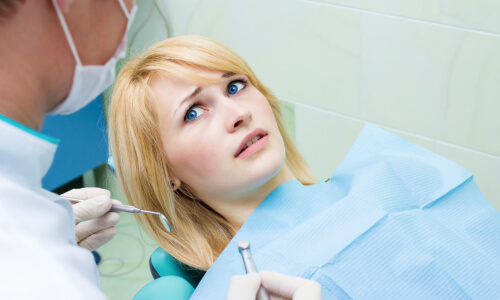 Chock it up to dental anxiety, no insurance, embarrassment, or perhaps just life getting in the way, but whatever the reason, there’s no better time than now to visit the dentist. If it’s been a while since you sat in a dentist’s chair, we want to see you here at Briter Dental. Continue reading to learn a little about what you can expect at your first appointment in our Houston dental office. At Briter Dental, we first want to assure you of two things. First, there is no need to be afraid of the dentist. Modern advancements in dental techniques and technology have transformed the oral care experience, making it generally more effective, comfortable, and efficient. Second, there is no need to be embarrassed about how long it may have been since your last appointment. We can sympathize with the fears or obstacles you may have faced and show you ways of overcoming them for the sake of better oral health in the future. If this is your first visit to our office, we will ask for a medical and dental history. This gives us an idea of any medical conditions you may have that put you at risk of dental complications. It also lets us know if there are any concerning symptoms you may have that could indicate the presence of an underlying oral health condition. Next, we’ll ask for your insurance information. Dental exams are often covered at no charge by dental insurance plans. If, however, you do not have insurance, ask about our new patient special, which affords one low, flat-rate price for an exam, x-rays, and a dental cleaning. Getting x-rays is a relatively quick and painless process. They give us insight into any issues that are hiding beneath the surface of your mouth. If you have previous x-rays on file from your last visit, no matter how long ago that may have been, we can also use the new x-rays as a comparison to identify any unusual or alarming changes that may have occurred since your last visit. If it’s been a while since your last dental visit, the cleaning process may take a bit longer than usual. During this time, the hygienist will carefully remove built-up plaque from the surface of the teeth and around the gums, where it might otherwise contribute to decay and gingivitis. Next, the dentist will come into the exam room to review your x-rays and visually inspect your teeth. Your exam may also include an assessment of your gum health and a search for any potential signs of oral cancer. Finally, the dentist will give you recommendations for additional care as necessary based on the results of your exam. For example, if your teeth show abnormal wear and your health history shows that you experience frequent headaches, you may need treatment for bruxism (nighttime tooth grinding), which is easily treated with a nighttime mouth guard. If your teeth appear healthy and no additional treatment is necessary, you’ll be scheduled for your next routine exam approximately six months later. Remember, at Briter Dental, we do not care how long it’s been since you’ve visited a dentist. Every day is a new day and a new opportunity to start taking better care of your teeth. For more information about visiting the dentist for the first time or to schedule your next check-up, contact our office today. You can also read more about our preventive dentistry.